4th of July tank top. Little Miss Independent. Little girl embroidered top. Patriotic, July fourth, America, USA. Toddler girl tank top. 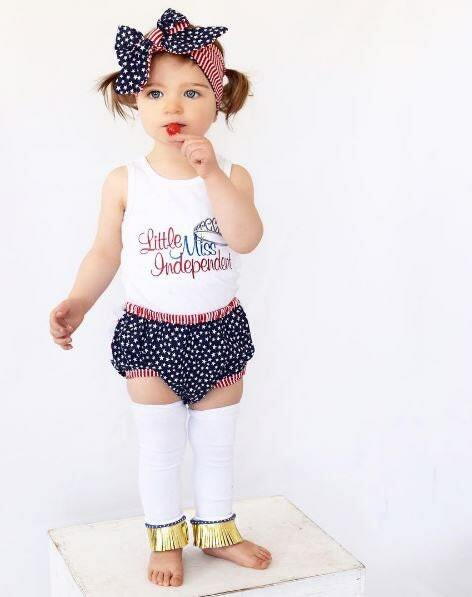 Little miss independent is custom embroidered on a girl's tank top or shirt! Perfect for the 4th of July and great to wear this Patriotic Summer! Thank you for visiting Gentry California! Connect with us! 4th of July flag with bow shirt. Patriotic July Fourth shirt for toddler, little girl. Red, White, Blue USA Shirt. American Flag outfit. 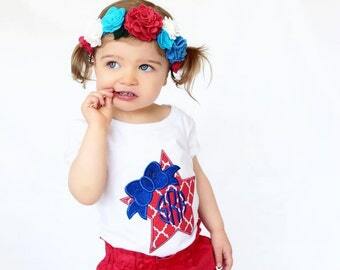 Fourth of July Monogrammed Star shirt with bow. Memorial Day Monogram Baby Girl Shirt. Red, White, Blue Patriotic Kids Clothes. America USA. Monogrammed Shirt. Little boy tshirt or bodysuit. Red, white and blue stripes. 4th of July. American Personalized Name. Baby shower gift. Baby Diaper Cover. Personalized Baby Bloomers. Ruffle bottom Newborn Baby Girl. Embroidered Name / Monogram. Cute Baby Shower Gift New Baby. Fourth of July infant bodysuit. July 4th outfit for baby girl, toddler. Red ruffle outfit with fireworks bow, star and monogram. Patriotic. Monogrammed Valentine's dress for baby, toddler, little girl. Red and White. Girl's ruffle dress with Embroidered monogram. Red 4th of July Dress for Infant, Toddler, Little Girl. Fourth of July Star and Bow. Red, White and Blue Patriotic Ruffle Dress. USA Outfit. Fall Dress with monogram. Cute pink monogrammed outfit for baby, toddler, girl. Light Pink Ruffle Winter dress with embroidery. Absolutely love this shirt. The shirt quality is great, love the gathered sleeve that slightly balloons making the shirt a bit more feminine. The appliqué is perfect for Easter and monogramming was exactly what we were hoping for. Easter bunnies shirt with name. Monogrammed Bunny tshirt or Infant Bodysuit for baby girl, toddler, child. Personalized Easter clothes. Perfect for my 12 year old daughter! Girl's hoodie with monogram. Monogrammed hoodie for girl. Junior Bridesmaid, Flower Girl hoodie with embroidery. Youth embroider sweatshirt. These are perfect for getting ready on the day of! Super lightweight so you won't be overheating in the hair and makeup chair. Will be great to easily take off and not mess up your hair etc. The monogram's came out perfectly and I had no issues with shipping or order details. Would recommend this shop! Bridesmaid Gift. Monogrammed woman's hoodie. Light weight zip up monogram sweatshirt. Birthday present. Embroidered women's clothes. I have previously purchased from this seller a year or so ago and was very happy with the cotton hoodie and monogramming. The cotton was soft and of nice quality. The craftsmanship in the making of the hoodie was very high. It wore well and laundered well. It became my granddaughter’s favorite sweater for mild weather. This time, the cotton did not seem as high a quality as the previous order and there was a bit of puckering on the zipper seam. it is still a very cute design and I am satisfied with my purchase. I accept payment through paypal or direct checkout. All orders must be paid prior to production. All sales are final. If we have made special arrangements to cancel your order, a non-refundable 25% fee will apply to cover any incurred costs on the behalf of the shop owner. Thank you for your understanding! I stand behind my products 100%. Quality and service are of the most importance to me. Please contact me within 3 days of receiving your merchandise, should there be any issues. Please note - due to the custom nature of our items, personalized items will not be eligible for return or exchange. Defective merchandise: Seller must be informed of any defective merchandise within 30 days of item receipt. At that time, if the item has been deemed defective (rather than standard wear and tear), we will replace the item with a comparable item. If it is after the 30 day period, we cannot replace or refund defective items. Thank you for your understanding. I will ship within 7-10 business days of payment. Custom orders may require more time, and I will notify you if that is the case. I ship through the United States Postal Service. I provide a delivery confirmation number with each order. Please contact me if you will need expedited shipping, additional charges may apply. We do ship all packages via USPS mail. Their shipping time frames are guidelines and we cannot be held responsible for shipping delays as that is beyond our control. If you package has been lost via USPS, we can open a claim after 30 days. If your package has been marked as delivered via USPS, you as the buyer will need to contact your local post office. We cannot be held responsible for packages that are marked as delivered but have not arrived to you. Thank you for your understanding. Please note: If you are ordering from outside the United States, delivery confirmation is not available and shipping times may vary. I cannot be held responsible for customs holds or import taxes. PLEASE NOTE: All pieces are custom created, so no two items are identical. That’s the beauty of the product! Please allow for slight variances from what is shown in the made to order photos. Accessories are not intended as toys and children should be supervised while in use. Missing information: If you do not provide name/monogram information at checkout I will attempt to contact you for that information. If at a certain point I have still not heard back, I will go ahead and make/ship your order without personalization. In regards to colors/fabrics, if you do not provide special notes to checkout with specific colors, I will go ahead and make as the picture shows. From time to time we are sold out of specific fabrics/threads. I will try my best to offer a good replacement so colors/patterns may vary slightly from picture. If it is a significant difference, I will contact you prior to making your order to confirm that the change is ok. It is the customer's responsibility to provide all personalization and sizing info. If it is not provided at checkout, your order will be delayed. Thank you for visiting Gentry California! Monogrammed Valentine's Heart shirt or infant bodysuit. Heart with monogram for baby, toddler, little girl. Valentine's clothes. Nautical Anchor Dress with Name. Monogrammed patriotic dress with anchor and bow. Summer dress. Baby Girl, Toddler Red Dress. Monogrammed Girl's shirt. Personalized 3 letter monogram for little girl, baby, toddler. Embroidered name. Children's boutique clothing. Bridesmaid Presents. Pink seersucker scalloped edge monogram shorts. Pink lounge shorts for women. Bridal with monogram. Embroidered.